Twins have a lot in common while being individuals in their own right. So it’s great if they can have birthday cakes that have something in common but are not completely the same. And chocolate is great because it comes in different varieties. And hurrah, so do Maltesers. I’m starting to think I should apply for a job with the Maltesers Marketing Board. (I’m sure it must exist!). Kylie, whose younger daughter is in my son’s school year, but who I know mainly because we do Boot Camp together (yes, really! ), asked if I could make her twins a cake each for their 16th Birthday and thought they would like these. So I made a vanilla sponge and covered it with white chocolate icing and added some chocolate Maltesers and some strawberry sprinkles. 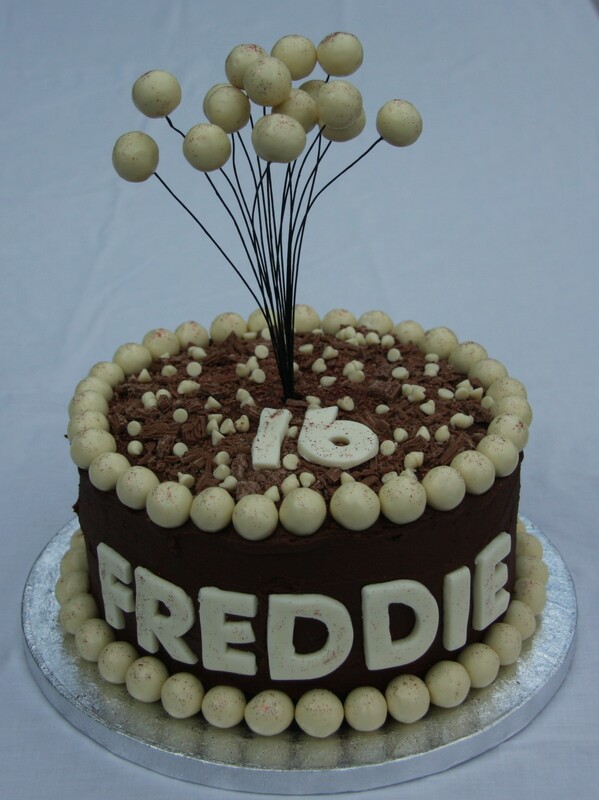 Then a chocolate sponge, covered with chocolate buttercream and decorated with white Maltesers, crumbled up Flake and white chocolate chips. 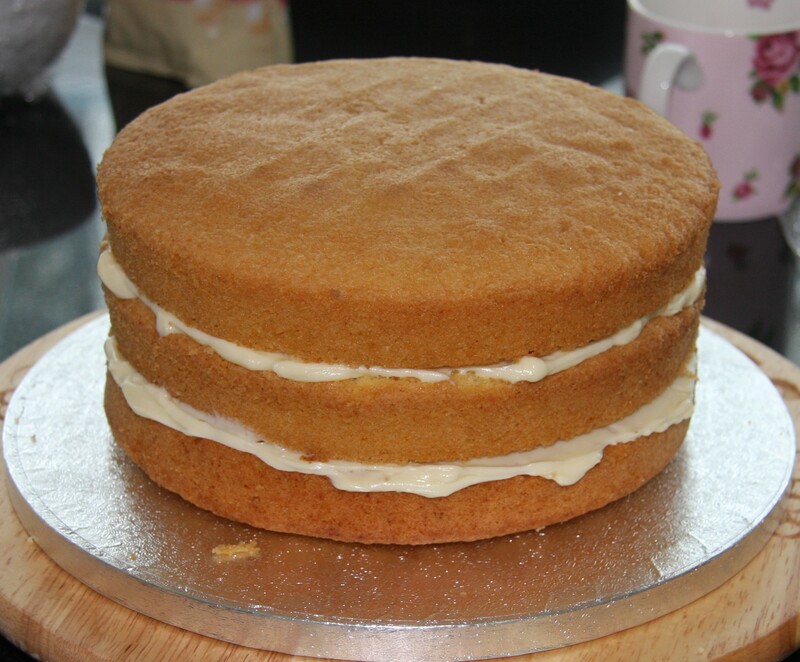 The main issue with making two cakes that are the same but not the same is the need for precision with quantities. My favourite sponge is a Victoria sponge mix. 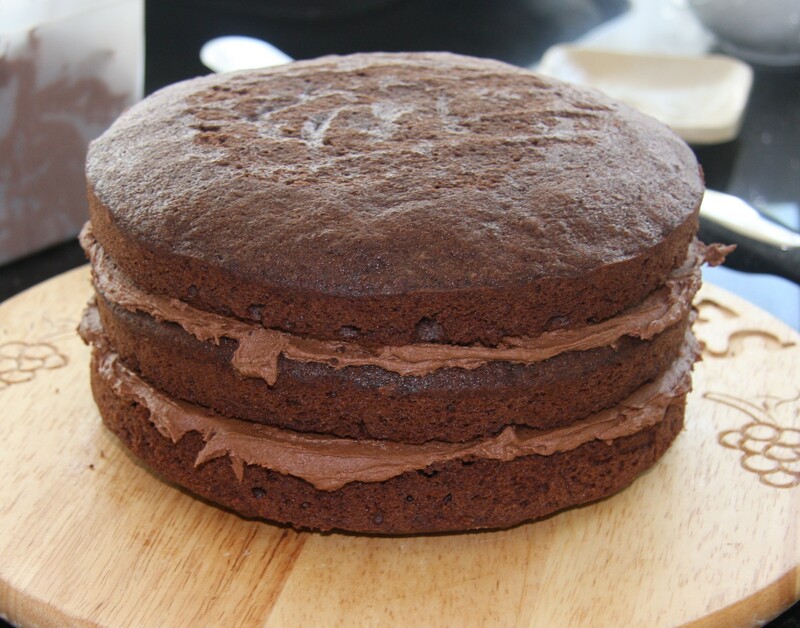 For a chocolate Victoria sponge I tend to use the same recipe plus cocoa powder, instead of replacing some of the flour with cocoa powder, which would keep the same ratios. So my chocolate Victoria sponge is generally not technically a Victoria sponge at all, probably more likely a madeira cake, in fact. But this time I made the chocolate sponge by replacing the same weight of flour with cocoa. I made sure the oven temperatures were the same each time so that they would rise by the same amount. And I even weighed each cake tin to make sure that the amount of cake mix in each layer was exactly the same. I wanted to do three layers for each cake and I baked the layers separately. I trimmed the top off the middle layer of both cakes so that it would sit flat. By putting Maltesers around the base of the cake I negated the need for a sharp edge at the base so didn’t need to level the base layer. And I baked the sponges on the lower end of the temperature scale so that they wouldn’t rise too fast and create an obvious dome shape that would then need levelling. I think these cakes look really pretty like this and would be great for any occasion. But a 16th birthday isn’t just any occasion so they needed a bit more. 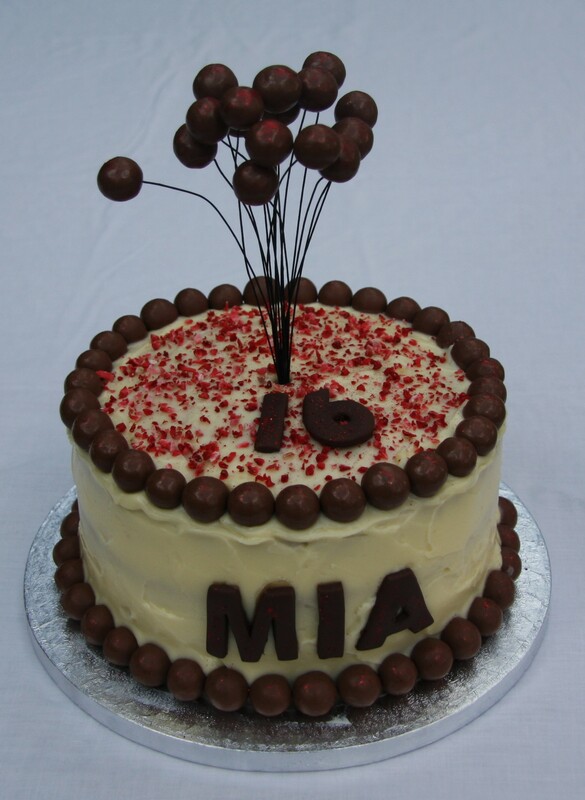 I dusted the cakes and the Malteser borders with red glitter and made a spray for each cake with 16 Maltesers. I cut out “16” for each cake and the girls’ names, Mia and Freddie from sugarpaste. I used chocolate sugarpaste for one and coloured some white sugarpaste cream for the other and dusted them with red glitter also. 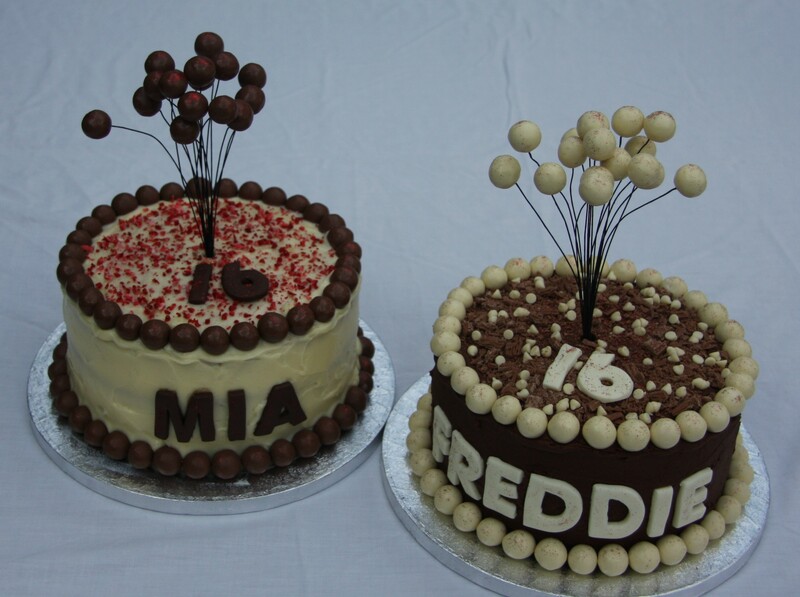 So Happy 16th Birthday to Mia and Freddie and many more to come! ‹ Homemade Focaccia – great for sharing! You’re a star. They are perfect! And I just KNOW they were both delicious. Great work! Such fun birthday cakes! I’m sure the birthday girl and boy really enjoyed them! Thank you – I should have said that they are both girls as it’s really not obvious from the names, my fault! My goodness those cakes are beautiful! Amazing cakes, extremely impressive and I bet they tasted delicious.